For the holidays, I decided to share a little holiday drink I made up for the occasion. I had some cookie dough vodka in stock and it is one of one liquors that are difficult to mix. But this holiday lends itself especially well to sipping, milky drinks — especially since you have to leave Santa some milk and cookies. 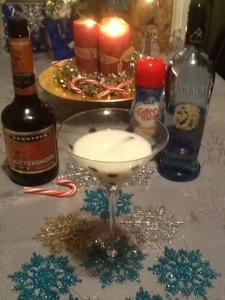 Give Santa a little something special with this Christmas Cookie Martini. Shake all ingredients in a shaker and garnish with a mini candy cane.